InsideTheBoxMarketing.com: Jay! Branding The Man - Part II "Lightning Strikes"
Jay! Branding The Man - Part II "Lightning Strikes"
Not sure who our opponent would be, we began formulating a campaign strategy. For maximum impact we decided to hold a media event officially announcing his candidacy the day before the primary (he would also file that day, the last opportunity an Independent could file for the November general election.) I felt it critical that the campaign theme, look and tenor needed to be established right out of the box. We needed to brand Jay Williams, especially in light of the fact that we would probably be facing an experienced, savvy Democrat party juggernaut by the name of Bob Hagan—a man with a compelling political brand of his own. With less than two weeks before our kickoff public event, we were still struggling with an identifying visual for our candidate. Sure, Jay had charisma, charm, good looks, intelligence and vision. Big deal. How could we get voters excited in him if they didn’t experience these qualities firsthand? How could we get them to want to know more? 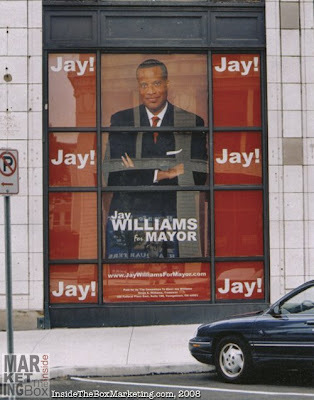 How could we find that simple, eloquent graphic that would not only define his candidacy, but separate the Jay Williams Brand from all the other political campaigns, not to mention the clutter of everyday ads for car dealers, grocery stores and funeral parlors? As many creative types will tell you, inspiration strikes when you least expect it. It happened to me at 3 A.M. Out of nowhere comes an idea for the campaign that was so simple, yet so elegant I was stunned. To this day, I cannot remember if I dreamed it or it materialized in that hazy landscape between consciousness and sleep. But there it was in all its maroon-colored glory—the letters J-A-Y followed by an exclamation point! JAY! A brand was born. This was quite a sight on the evening news and on the front page of the next morning’s Vindicator; 200 people waving JAY! signs! Actually, the campaign kickoff announcement received more news coverage than the fact that a primary election was going to take place to determine the Democrat party’s nominee. We were giddy in the thought of the presumptive Democrat nominee sitting in front of his TV wondering how he was going to raise another $150,000+ for the general election to fend off this upstart kid who suddenly appeared from out of nowhere. Jay? Jay who? We were on our way. Strong out of the box. A marketer’s dream. The key to maintaining value from any brand is consistency. Throughout the mayoral campaign the JAY! logo was everywhere: T-shirts, TV commercials, billboards, the campaign website, buttons, mailers, even next to Jay’s 20-foot high photo on a building on Central Square--directly across the street from Hagan headquarters! We took advantage of what I initially considered to be the candidate’s negatives—youth, inexperience and race, and turned them into hope, vision and change, then wrapped them up neatly in a simple graphic, utilizing three letters and a punctuation mark. Without a doubt the defining move of the JAY! branding campaign was when the two-story JAY! dispay went up across the street from the single-story display of the competition. BRILLIANT! with an exclaimation mark. That move told everyone including the competitor's campaign that "JAY! is for real". The first call anyone seeking any office should make is Keynote and richard.